Bangkok – Thailand, love it or hate it! It’s one of the best cities in the world, but to say this it took me almost 8 months living in Bangkok. On my first trip to Bangkok I hate it! I hate it with all my soul… However doing some research and meeting local friends I learned to enjoy the city, how to find cool things to do in Bangkok, awesome places and unique experiences that you can only have in this great city. You may be travelling to Bangkok for a holiday, or a few days stopover before heading to the amazing Thai Islands [here is all you need to know about Phuket and Thai islands], you can’t waste time trying discover the cool things to do in Bangkok. To help you make the most of your holiday, we wrote this guide. It´s an upgrade of the traditional Bangkok travel guide we wrote with all famous tourist attractions and transportation tips. Here you gonna find unique things to do in Bangkok, places and experiences that will turn your trip to Thailand memorable. Wish I had a guide like this before my first trip to Bangkok, it would have saved months of my enjoyable life here. Before we get started let’s assume you already booked your flight to Bangkok [if not, click here for the best airfares]. In case you are traveling overland we recommend checking 12GoAsia, where you can search and book trains & buses. And that you already have an idea what are the main tourist attractions in Bangkok [like Wat Poh Temple, Grand Palace, Chao Phraya River…]. Because this post is gonna give you extra tips on how to have fun and enjoy Bangkok. Some amazing hotels to stay, local experiences and even some adventure. Follow us on a journey through the unique and cool things to do in Bangkok. First things first, you need a place to stay in Bangkok. A hotel that is well located, near to all the tourist attractions, comfortable, and preferably with a scrumptious breakfast. 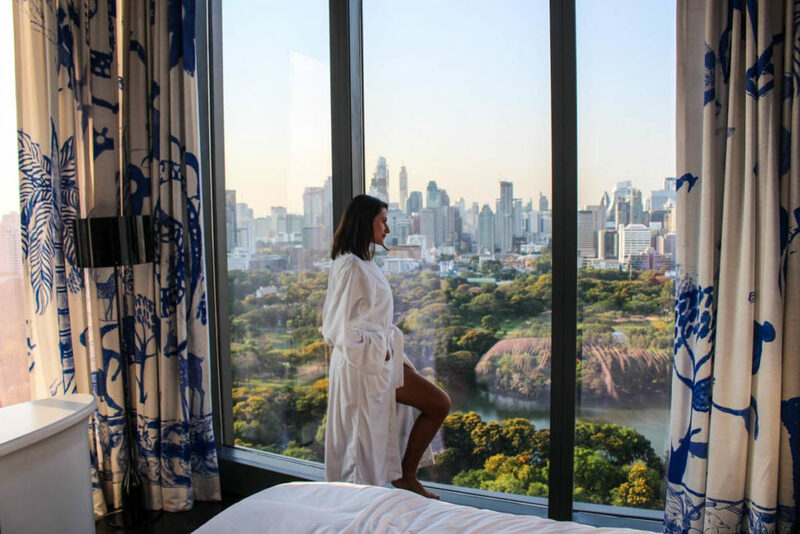 Although, if you are looking for awesome things to do in Bangkok I would add to the list above a great view, a stylish room and art. It´s Bangkok, a unique experience in the city starts with a unique hotel. The hotel concept was created by “monsieur” Christian La Croix for the renowned French hotel chain Sofitel. The result is a hotel that goes beyond your senses, and will make you feel you are in an art gallery, or in a trendy bar or restaurant, rather than in a hotel in Bangkok. You can choose among 238 rooms spread across 30 floors and 4 themes: Metal, Earth, Wood and Water. You can pick a room that suits your style or try something new. We stayed at the SO Comfy Earth room, the edgy style and the view of the corner suit was jaw dropping. Book your Room at SO Sofitel Here! SO Sofitel gives you more than good a night of sleep. Among the cool things to do in Bangkok, a few of them are literally inside the hotel. Pool party with gourmet food and special cocktails, checked! Rooftop bar on the 30th floor with the best view of Bangkok, checked! A breakfast and swimming pool overlooking Lumpini Park, checked! Where else in the world can you stay in a french design hotel, overlooking a cosmopolitan skyline eating noodles for breakfast.? Only in Bangkok baby! Oriental Residence is one of the best hotels in Bangkok and we nominated it as one of the best choices for a romantic trip in Bangkok [check our full list of Romantic & Honeymoon Hotels in Thailand]. The hotel has everything you need and desire with elegant service and flawless decoration. It´s luxury, classy and clean. There nothing is over or too much, it´s always perfection. It’s the perfect choice for people who want be close to all the attraction in Bangkok, with superb rooms and good options of dining and breakfast at the hotel. We stayed at the Grand Deluxe Suite and love it! The room has a homey feeling, all you need after a long day exploring all the awesome things to do in Bangkok. Check Oriental Residences Bangkok Availability Now! If you want to check all the interesting things to do in Bangkok, stay in a great hotel and also save some money, Amari Watergate is perfect for you! The hotel is huge, and it´s in the heart of Bangkok, surrounded by shopping centers, street markets and food stall. But what we loved about Amari is not the strategic location, is the Executive Club they have. We stayed at the Executive Suite and had access to the Executive Club, what means that we had the privilege of staying on the top floors, a lounge on the 32nd floor with special breakfast and daily happy hour only for executive guests. Super comfy rooms, great view and daily free drinks and gourmet food to start the evening. This is a great deal!! Book your stay at Amari Watergate now! When I say that I hated Bangkok, I was telling the truth. The traffic in the city is mad, some days the air pollution can make you dizzy, and the smell of Thai food can be surprisingly strong. 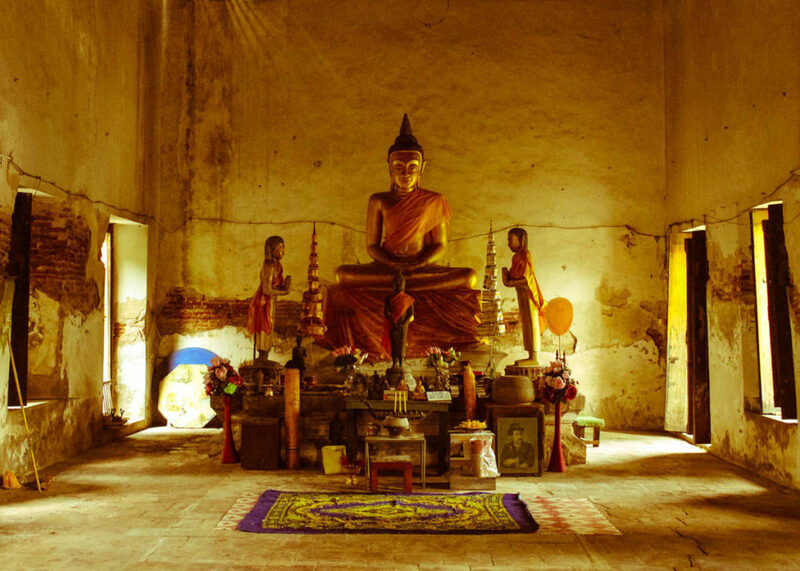 You will find yourself tired of haggling with taxi drivers and hopping for one stunning temple to another. When you feel that you had enough of the urban and chaotic Bangkok, is time to see another side of the city. It´s time to visit Bang Krachao, a unique attraction in Bangkok and still unknown for many travellers. 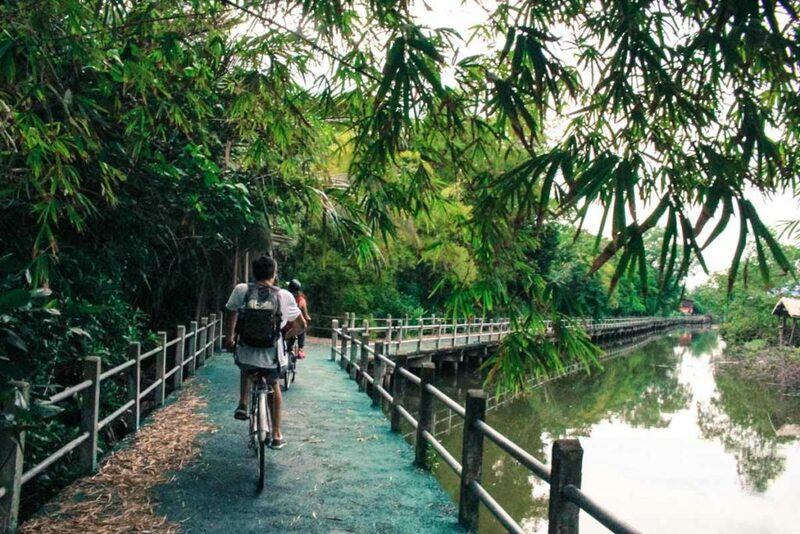 Most of Bangkok travel guides only mention Lumpini Park as the green escapade of the city, but actually Bang Krachao, an island in the middle of Chao Phraya River, is the green lung of Bangkok. A big part of the island remains preserved, with a few houses and cars, some local business and a park. The best way to get around is by bicycle, so prepare your comfy clothes and let´s go cycle. Join a tour to discover Bang Krachao Island! Visit the island is not that easy, but totally worth it. No doubt it’s one of the cool things to do in Bangkok, and if you go during the week it will be very quite and enjoyable. The best way to go to Bang Krachao is to take the BTS Sukhumvit Line till Bang Na Station, there you get a taxi and ask for Bang Na pier or Wat Bang Na temple [here is the map from the station to the pier]. At the pier you will find a ferry to Bang Krachao, don’t be scared, people and motorbikes go all together, fine. When you arrive in the island, just beside the pier you will see a stall selling drinks and renting bikes. Rent a bicycle for the day, buy some water and don’t forget to ask for a map. Go and explore Bang Krachao! You might cycle a lot, but the vibe is awesome. And you might get lost, but don’t worry it´s an island, you will find your way back to the pier. In the island there is a nice and hipster hotel [Bangkok Tree House] with a cafe for a strategic stop and some refreshments. If you feel like doing local activities there is a cooperative that teaches you how to make herbal pillows [you can get a massage there too] and another place where you can learn how to make joss stick and other Thai handicrafts. Don’t forget to visit the ancient temples, they are stunning! Traditionally all the Bangkok travel guides will tell you to watch a Muay Thai Fight, and do it, it’s great! Although, as we are talking about cool things to do in Bangkok and unique experiences you can find in this amazing city, I will give you a different suggestion. When travelling to Bangkok go surfing! No, I’m not crazy, I’m only taking your holiday trip to Bangkok to a different and awesome level! It’s no secret that Rob and I love water sports. While travelling in Bangkok we found a great way to fulfill our desire for adrenaline: we went surfing! And it turned out to be one of coolest things to do in Bangkok. The name is Flow House and there you can surf on a static wave, try your balance and surf moves, or just laugh yourself off with all the falls. From kids, to couples, to friends, everybody can have fun, you don’t need to be a surf expert. Thailand produces a lot of coffee, and if you travel to the Northern part of the country you can visit hill tribes that produce organic coffee. But if Chiang Mai is not on your travel plans, you can satisfy your passion for coffee in Bangkok too. You can take your taste buds through a journey of heavenly coffee and discover hidden places in Bangkok. Cafes, restaurants and bars well decorated, with stylish crowd and speciality coffee. Our journey through the best cafes and coffees in Bangkok was guided by Pippo, a lovely Thai guy that knows everything about espresso, cappuccinos and lattes. We found him through Take Me Tour, a really cool company that connects local people and travellers. You get to experience the best of Bangkok with a personal and passionate guide. We love coffee and the 4 hours tour we did with Pippo was beyond our expectations. BOOK YOUR TOUR WITH PIPPO NOW! We went to 5 different cafes, all them hidden in trendy neighborhoods and small streets that we would never find by ourselves. Pippo drove us to all the places, and every stop a new story and more cool things to do in Bangkok. We tried different types of speciality coffee from Thailand, Colombia, Costa Rica and many more. We not only learned about coffee, we also discovered a new side of Bangkok that most of the tourists will never see: local designers, artists, coffee lovers and young entrepreneurs. All this while sipping good coffee and eating delicious Thai food! Five stars for Pippo! What a unique experience in Bangkok we had! 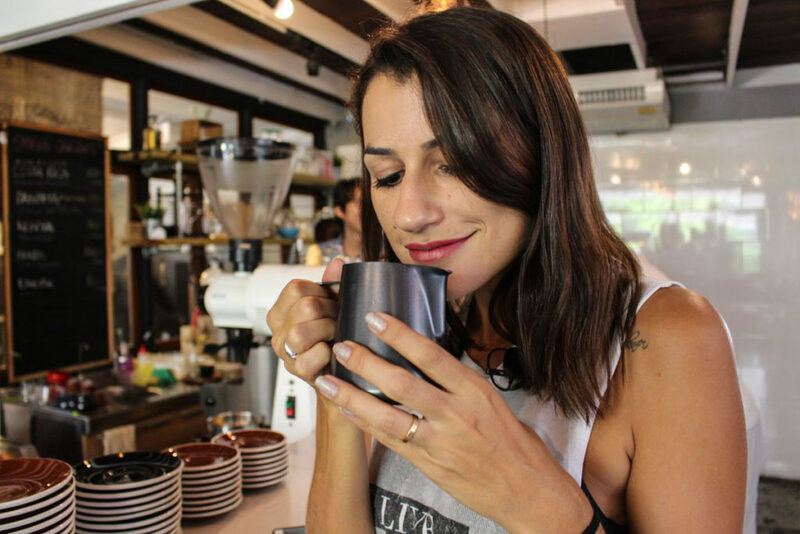 If you don’t like coffee don’t worry, Take Me Tour has many local tours and I’m sure you will find other unusual and interesting things to do in Bangkok with them. Thai food is delicious [at least for us]! But I totally understand when travellers tell us that after a week in Thailand they are tired of eating Pad Thai and fried rice, that’s normal! 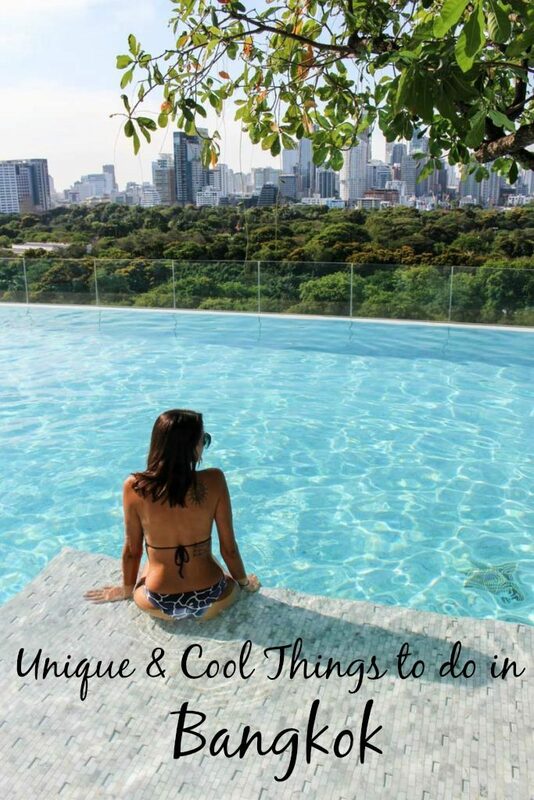 That´s why our list of cool things to do in Bangkok includes food, but not only Thai food. Bangkok has an enormous range of international restaurants, serving from French cuisine to Argentinean steaks. Tripadvisor is the best tool to find restaurants in Bangkok, if you are in doubt if a place is good or not, check the reviews on Tripadvisor. But it doesn´t work for Thai street food or small local eateries. So here is our first food advice, if you feel adventurous go and try everything from the streets. If it smells good, if it looks clean, eat!! However, if you are not confident enough for trying street food, we have you covered! One of the cool things to do in Bangkok is to go for a lunch or happy-hour/dinner at the Commons Market. It´s a mix of a gourmet food restaurants in an open space market. A mall where people get together to share food and good moments, such a unique thing to do in Bangkok. The crowd is a mix of expats and Thai. All the restaurants are gourmet, cooking with the best ingredients, fusion recipes, in a cool and modern atmosphere. You can try Thai dishes and also international menu as lobsters, pasta, french pastries and many more. Have you fall in love with Bangkok? Hope your answer is “Yes”! We want to inspire you to discover a new side of the city and all the unusual things to do in Bangkok. Thailand´s capital is more than temples and handcraft/souvenir markets, more than Khao San Road and Chinatown. All these places are great, interesting attractions that you must visit, but go beyond them. If you are travelling to Bangkok for the first time, don’t forget to read our other guide, where we help you to plan the perfect travel itinerary for your trip to Bangkok. Bangkok is a destination itself, a place you can stay a week or more and your days will be packed with unique activities and awesome things to do. When planning your trip to Thailand don’t use Bangkok only as a base to arrive, shop and leave the country. 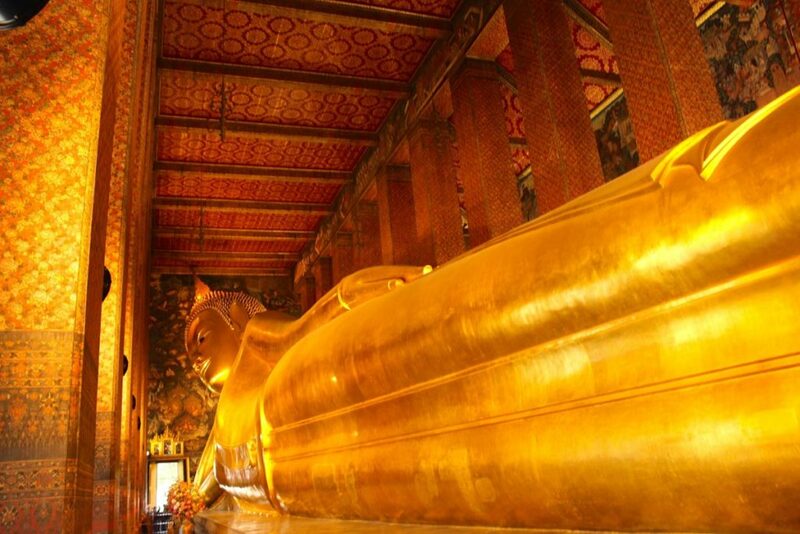 Stay some extra days and follow our tips for cool and unique things to do in Bangkok. I’m sure you will leave Thailand with a different perspective and a desire to come back! If you wanna know about prices and how much does it cost to travel in Thailand, we have another blog post with all the costs to travel and live in Thailand, ready to help you! Do you like our suggestions? Any more tips about unique and cool things to do in Bangkok? We are always in search of awesome experiences! Thanks for all the great tips and advice. We’re still planning to spend a few months in Thailand next spring so your ideas from across the country have been a great help. Keep having fun you guys! You are welcome! I’m sure you gonna love Thailand!!! Great list! 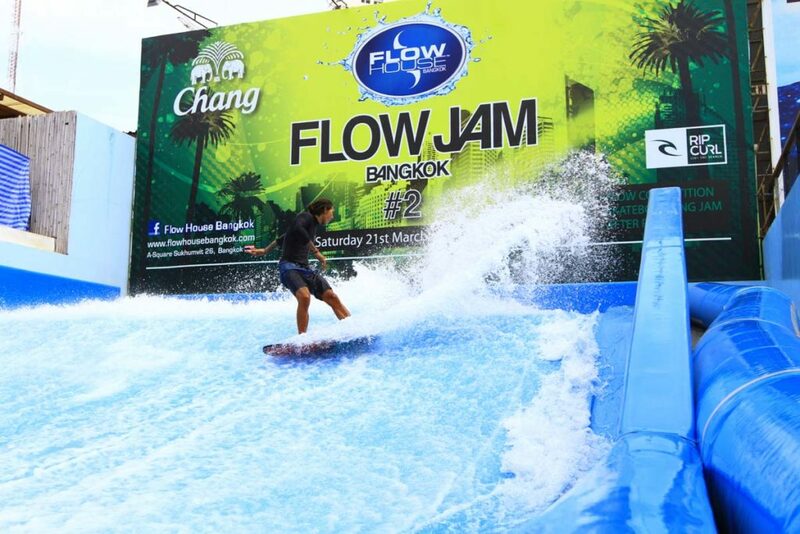 Had no idea there was surfing in Bangkok-looks like a lot of fun! The static wave surf is great, a bit hard to do it, but so much fun!! Bangkok is an incredible city indeed! Bangkok is a huge city, full of secrets and surprises. And that’s why I like it so much, the contrasts and so many options!! The surfing is awesome Vanessa!! Such a cool and unusual thing to do in Bangkok! So Sofitel has a killer view, the most beautiful one in town! I’m sure you gonna love it! You are a rockstar!! (you are a star and you rock :-D). I love your style, pics and this post. Why did you hate Bangkok at first? The hotel looks great and the views show me a city so green… I didn’t expect it! Bangkok is too busy, too dirty, too many people… it takes you out of your comfort zone very fast and intensely… That’s why I didn’t like love it at the first sight, but now I love it! One of my favorite hotels in the world is in Bangkok – I stayed there five years ago and still send family and friends there. One great thing about Bangkok is that there are so many hidden corners and undiscovered amazing things there, you almost always feel like you’re the first to find something or stumble upon something. it is pure magic. Your are so right Drew!! I think we could live in Bangkok for 5 years and it won’t be enough to see and discover all the hidden places. That city is amazing and keeps surprising me! I’ve heard mixed reviews about Bangkok – we have the opportunity to visit soon, though we’re generally not big city travelers – we enjoy nature & the outdoors. So I’m thinking an escape from the urban & chaotic city center may be right up our alley. I hadn’t heard of Bang Krachao, so I’m glad I came across your post! Thanks! Definitely you gonna like Bang Krachao, it so relaxing and green there, very different from Bangkok. If you like outdoors, maybe is worth to check Koh Kret another islands on Choapraya River but on the north side, around Nonthaburi area. You must go back, there are so much to see and do in Bangkok, that a yearly trip would not be enough! Love the idea behind this post! I’ve passed through Bangkok quite a few times, but I’d love to stay for a while and get to explore all it has to offer. We want to show a different side o Bangkok. Most of people only visit the temples and go shopping there, but the city is amazing and worth a long stay! Incredible photos! I have yet to visit Bangkok but it’s high up on my list. I’ll definitely bookmark this post, thanks for sharing. Carmen, if you come to Bangkok you must stay and So Sofitel or Oriental Residence Bangkok, I’m sure you gonna love them!!! I can only do big cities for a few days at a time without getting a bit claustrophobic so cycling around the green space on Bang Krachao is really appealing to me and stumbling across an old temple or two would be a definite bonus. You are right that it’s somewhere you don’t usually here about so tips on getting there are really appreciated. Bang Krachao is a stunning place, completely different from the urban Bangkok. There are much more Danik! Our 8 months there weren’t enough to discover all the secrets and hidden places!! But were enough to love the city! I didn’t love Bangkok on my first visit either. But now, it’s not my favorite place but I really enjoy going partially because you can find a lot of hidden gems. Great job pointing some really good ones and a few I didn’t know about. You picked some great hotels and next time I go I’m going to check out Bang Krachao. And please put Bang Krachao on your next trip, I’m sure you gonna enjoy it! I love the hotel choices. One of the most important thing for us when we are choosing a hotel is the view. I would love to visit the Gourmet food market as well as learn to surf. 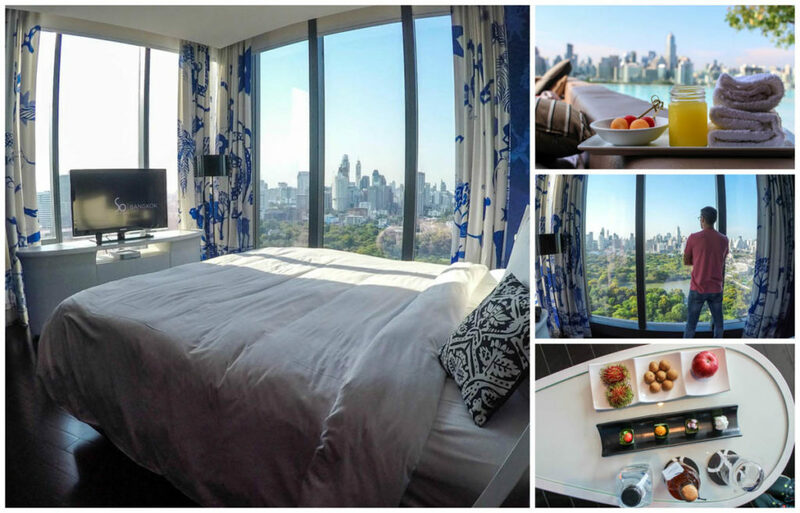 The views from the 3 hotels we suggested are to die for, no doubt one of the best in Bangkok!! Great list! We always tend to skimp on the accommodation wherever we go so that we have a bit of extra cash to enjoy the destination – but your hotel recommendations are incredible! I might try living it up in style on my next visit to Bangkok.. and anywhere else! Awesome guide! This guide can help me budget my way thru the trip to Thailand! Thank you so much! Hope you enjoy Thailand and Bangkok, it’s a great country!